Cats may not hold the title of “man’s best friend” as their canine counterparts, but they are certainly special to humans. 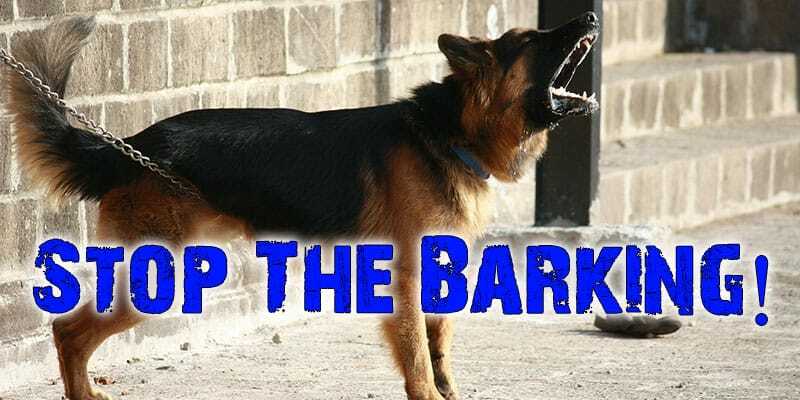 Just like with any other pet, we have a responsibility of caring for them, and feeding is a part of that responsibility. However, most of the times we are not always at home to feed them when they get hungry. 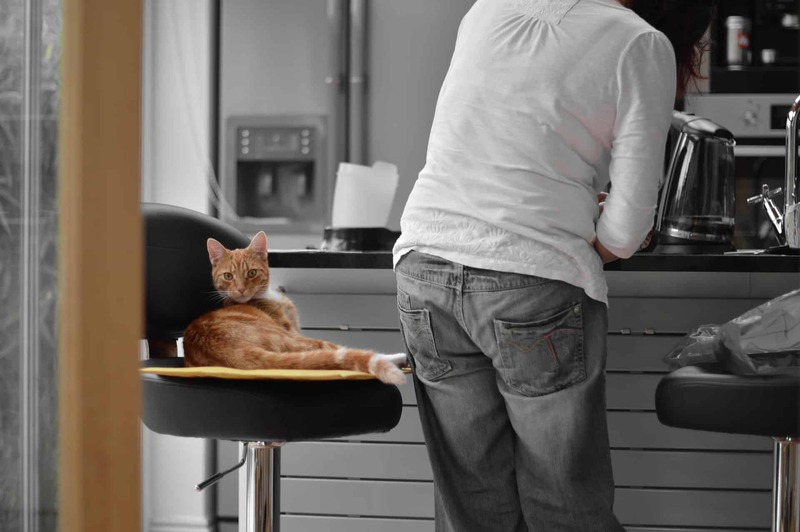 Busier schedules and increasingly hectic lifestyles can mean that our feline friends might end up delaying taking their meals. Get an automatic cat feeder to solve this problem; it ensures your cat gets their meals on time even when you are not there to feed them yourself. There are many different brands making these products on the market; some can be configured using mobile devices while others can be programmed. Although having a wide variety of automatic cat feeders is great for users, it can be frustrating especially if you are looking for the best one to buy. 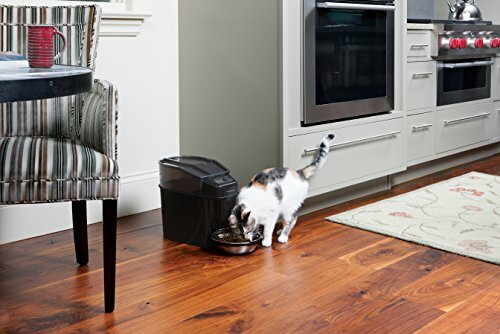 To help simplify your shopping process, we have gathered information on tips to finding the best automatic cat feeder and reviewed the best products on the market. What Is an Automatic Cat Feeder and How Can You Choose the Best One? We can simply define an automatic cat feeder as a device designed to release portions of food for your cat to eat at set intervals. Of course, kinds and styles of these feeders vary from one manufacturer to another, but they all serve the same purpose. However, some are more durable and convenient than others. They help control the amount of food give to cats. Most of them have seals which help keep your cats foods from insects and flies. So, how do you get to choose the best automatic cat feeder? You need to consider the kind of food an automatic cat feeder can use because there are different kinds of feeders for different foods; from solid foods and soft foods to pelleted food and wet foods. Make sure to select a cat feeder that is compatible with the pellet size of your favorite cat meals; otherwise, it may not be able to dispense food to your four-legged feline friend. If your cat is on a diet, you need to select a feeder that dispenses small food portions in a periodic manner. If your cat is a frequent eater, then you may need to go for one with a regular feeding interval. There are models with programmable systems that lets you customize feeding intervals. The amount of food your cat feeder can dispense in one go is an important factor to consider as this will determine the amount of food your cat will get. You can go for a feeder with an adjustable portion dispenser. Most modern cat feeders offer custom timing adjustments that allow you to set time when you need to feed your cat. This comes in handy when you want to schedule timings for a cat that is on a dietary plan. Some feeders also come with preset portion size and time that food should be dispensed in; they are programmed. What Factors Should Look For In an Automatic Cat Feeder? If you have a kitten that is not yet ready to eat dry food or your cat prefers wet food, you may need a machine with a cooling system to keep cat’s food fresh- especially during summer. Most devices have a compartment underneath the feed tray where you put an ice pack. However, even with a cooling system, we would recommend you using wet foods that will stay for a day or two without getting spoilt. A larger capacity machine means you can let the device do its job for a long time with less involvement. This is particularly handy if you have a busy schedule and you are hardly at home to feed your cat. Having a machine with a larger food capacity means that you can put a week’s worth of cat food for your feline friend to feed on every day. Typically, gravity-fed machines are the only feeders that are capable of offering such functionality, and they only accept dry foods. 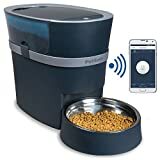 Therefore, before buying these devices, ensure your cat is happy with eating dry foods. This is probably dictated by your cat’s preferences more than you. If your cat prefers wet food, changing them to dry foods might not work. Therefore, before buying an automatic cat feeder, ensure you test different kinds of foods, both dry and wet foods, to see whether your cat enjoys both. Timers are the backbone of automated cat feeding devices; they let you feed your cat when you are not there to do it yourself. This why you need to consider how often you need your feeder to dispense food in a day or week. Do you have time to refill it in the course of the day? Or would you prefer to have one that needs a weekly refill? By answering these questions, you will be able to narrow your options and ensure you buy a feeder that will meet your needs. Finally, you need to check guarantee offered by the manufacturer. Are the warranty conditions sensible? 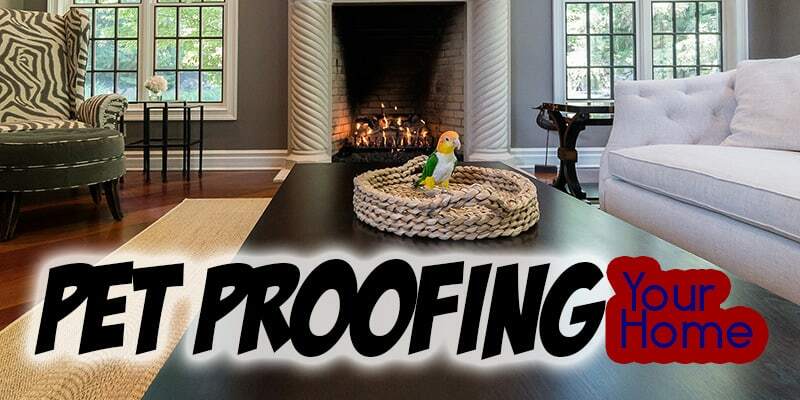 A brand with trust in its products will give a warranty that lasts at least a year. We can now review the top-rated automatic cat feeders on the market in 2018. Shall we? 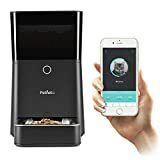 This healthy pet feeder from PetSafe is one of the best automatic cat feeders that dispenses food chunks up to twelve times a day, satisfying the needs of your feline friend. The feeder has an internal conveyer belt that dispenses accurate portions and is designed to work with semi-moist and dry kibbles. You only need to customize your cat’s meals by deciding the number of portions you would like device to offer each day. It is capable of dishing up portions as small as 1/8 of the cup and as large as four cups per feeding. 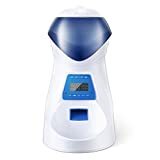 With a special slow feed feature, it can dispense meals slowly over a period of 15 minutes thereby preventing fast eaters from eating hurriedly, bloating, and vomiting after that. By slowing down a fast eater’s pace, you will make your cat healthier and happier. PetSafe Automatic Pet Feeder is ideal for all cats, but it is more useful for cats that need to lose or maintain their weight. By giving cats small portions and maintaining a regular feeding schedule, you can use this as a device for safe, convenient weight loss. Your cat will enjoy frequent feedings and will not feel deprived. This device is roomy, as it has a 24-cup capacity. It has a clear lid that provides a view of the hopper. This allows you refill it when you notice food supply is running low. Despite its roomy capacity that can hold 1 gallons of dry pet food, this feeder has a small footprint. With a width of 9 inches, a length of 19 inches, and height of 12.5 inches, it can be tucked into a corner of a room with ease. 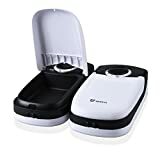 It features a black casing that matches most interior décor and has a removable 5-cup capacity bowl that is dishwasher-safe for easy cleaning. This sleek feeder comes with a quick-start guide and user manual. The PetSafe Pet Feeder is suitable for both cats and dogs but is often marketed as a cat feeder. 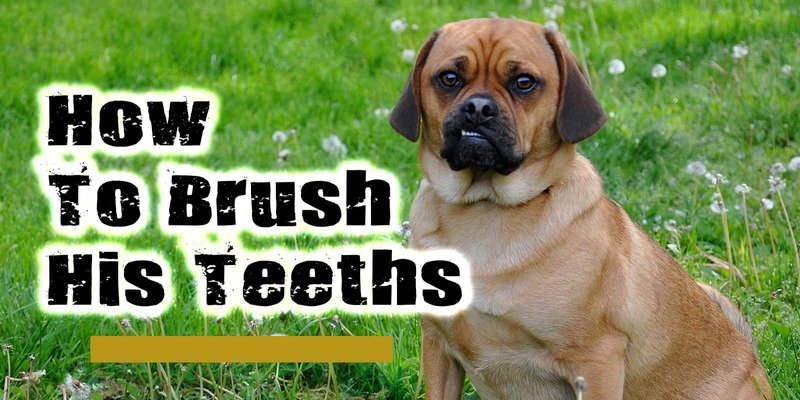 However, you can use it for small dog breeds; don’t make a mistake of using it for a dog that tends to get physical most of the times because its plastic body will not stand up rowdy chewing. The device is battery operated for convenience. While some automatic cat feeders are only electric-only, this quality pet feeder from PetSafe runs for up to a year on four D batteries. Therefore, you can place it anywhere in your home without worrying about finding a socket. You can also purchase a power adapter to add flexibility; it allows your feed to run on electricity. Another appealing feature of this feeder is that it is made with food-safe materials including BPA-free plastic as well as stainless steel. Some parts, such as stainless steel bowl, are dishwasher safe. 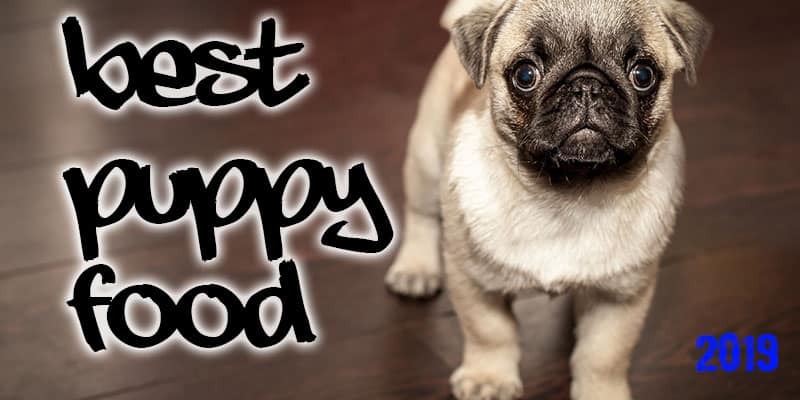 The Qpets LCD Automatic Pet Feeder is yet another fantastic pick that holds up to 6 meals. If you are searching for a cat dish feeder rather than a bulky feeder, this may be what you are looking for. Pet owners who seek an easy way of feeding their feline friends without the need to store pounds of food in a feeder have found this a favorite option. The feeder boasts a lid that locks firmly in place and has a safeguard protection system that restricts the cunningly smart cats from overeating. This dish feeder has the dimensions of 12.6” x 12.6” x 5” and uses 4 C sized batteries to run (Note that these batteries are not part of the package). The additional plus with this feeder is it comes with a low battery indicator to notify you when low to ensure it doesn’t stop working. This is an amazing feature especially if you away all day. The feeder is also equipped with a microphone and a speaker and can record a 6-second personal message for your pet. 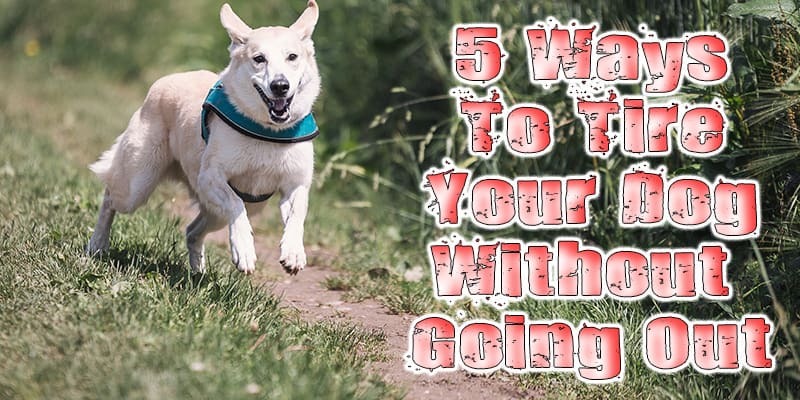 The last thing you need is your pet being unable to access food when the right time comes. If you’re gone all day, this feature offers a personal touch and your pet will not feel so lonesome. Isn’t it sweet when they hear your voice calling them to do what they do best? The lid comprises of dual snapping locks to ensure your pet doesn’t pull the cover off to access extra food inside. The feeder is excellent at monitoring as you can place small options of food in the tray. 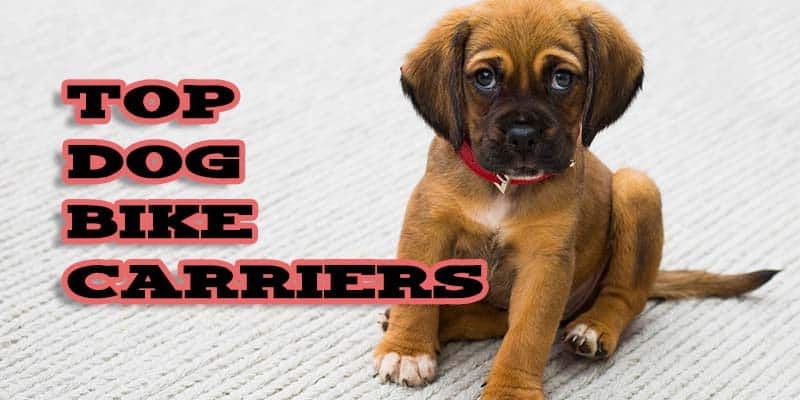 That is if you prefer your pet to eat smaller quantities of food more frequently. The feeder’s feeding slots are removable for easier and proper cleaning. This dish can be pretty tricky for first-time users. You will need to reset the tray every single time a cycle is complete. It only operates with batteries. 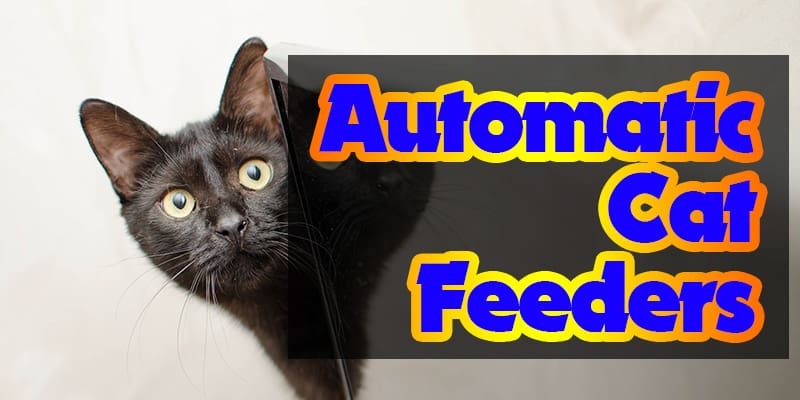 Pet Feedster PF-10 CAT is one of the most efficient automatic cat feeders on the market. This quality device works best for cats with an enormous appetite. 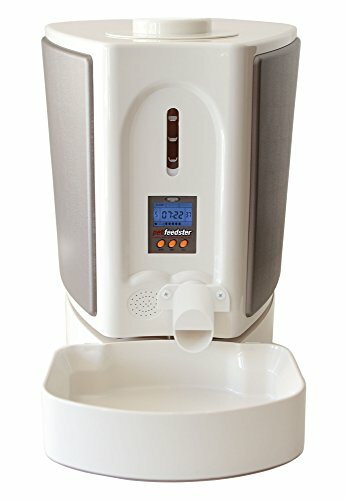 Therefore, you don’t have to refill it frequently as it has a larger reservoir. However, this best automatic cat feeder lets you control your cat feeding rate by dispensing food according to your set schedules. In addition, it leaves little snacks to keep your cat happy. Setting up and assembling this device is pretty straightforward. Besides, setting the program features is also very simple. Basically, if you have ever corrected time on a digital watch, then this feeder shouldn’t be a big deal. Another outstanding feature is its smart design that enables it to stand against any food theft. Therefore, if your cat tries to steal some kibbles using her paws, she will not succeed. This durable feeder is ideal for a headstrong feline. Its Flex-Feeder feature enables it adapt to your cat food instead of you changing your cat for the feeder. 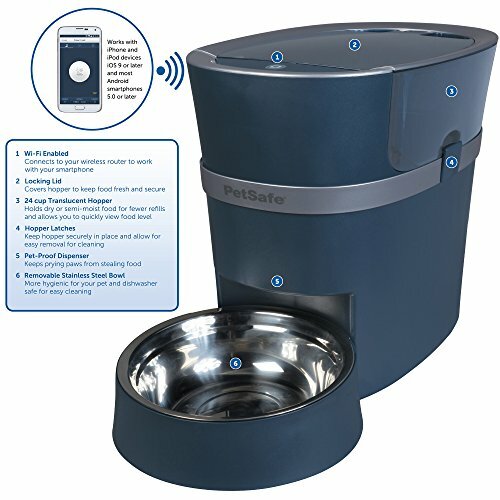 It can dispense kibbles from 1/8- 3/4 inches in diameter. You will not lose this cat feeder even during a power outage as it comes with a battery backup. 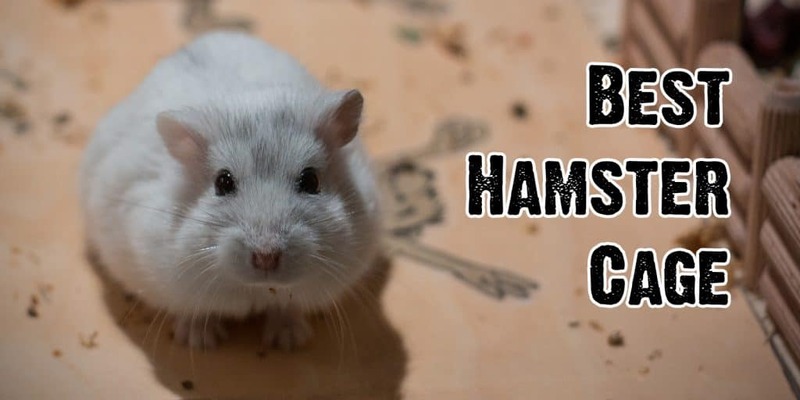 Therefore, when you are not around, you can set your feeder to operate on batteries. 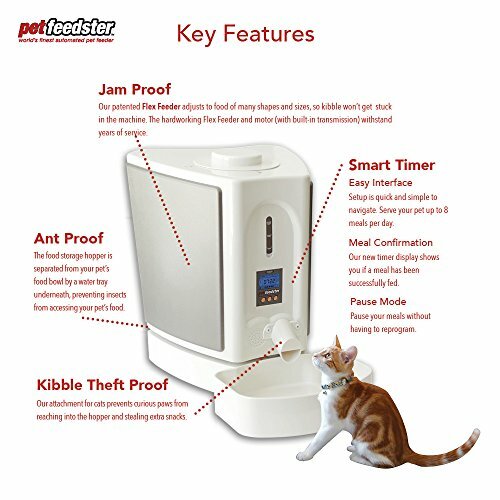 There are many other features that make this automatic cat feeder one of the best in the market including ant-proof or jam-proof ability. It also has a pause mode, accurate time display, as well as eight meals a day serving schedule. “The special chute design on Pet Feedster PF-10 CAT won’t dispense kibbles unless it is on the schedule. 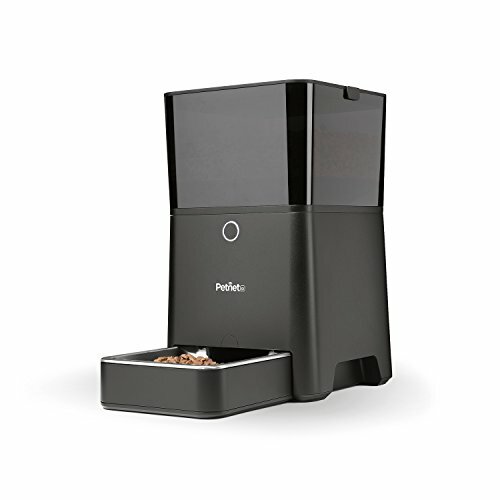 Pet Feedster PF-10 CAT is one of the most efficient automatic cat feeders on the market. This quality device works best for cats with an enormous appetite. Therefore, you don’t have to refill it frequently as This is a single meal cat feeder with an excellent feeding capacity of 48 hours. It is used smoothly with both dry and wet food. Better yet, it has a simple but accurate programming and allows you to schedule based on per hour, thanks to the 48-hour timer. The cat feeder works the best when you need you to feed your feline friend in the early morning, but you need to feed your cat at regular intervals. 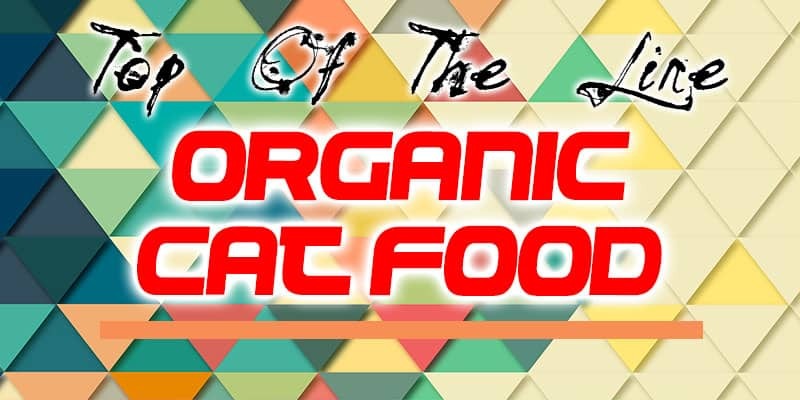 It’s important to understand that you need to avoid putting out dry and wet food in the kitchen as it emits a foul stench and attracts ants after a few hours. For dry foods, it offers a resistant material and has an adequate size which works just perfect. For wet food, you can expect the ice packs to keep the meal cool and fresh. Do you need a device that can work for longer stretches? This is a perfect model for you as it can work overnight. I realized that most wet food feeding systems don’t work too well with the icepacks which made me find something with a bigger food capacity. The WOpet Automatic Cat Feeder is standard and not budget breaking. You will find it easy to use, and the feeding process will become much simpler as your hands don’t have to get dirty especially in the middle of the night. I found this design my favorite as it comprises of simple features to get the job done quickly and easily. What’s more, the feeding bowl is detachable which makes cleaning an easy task. The other parts of the feeder are incredibly easy to wipe where you can use warm soapy water for a sparkling appearance. The feeder comes with an effective On/Off switch which is why I found it easy to use. Better yet, you only need a single meal in 48 hours with nothing more complex. Worried about getting late to work again? Feeding your cat should not feel like a duty. 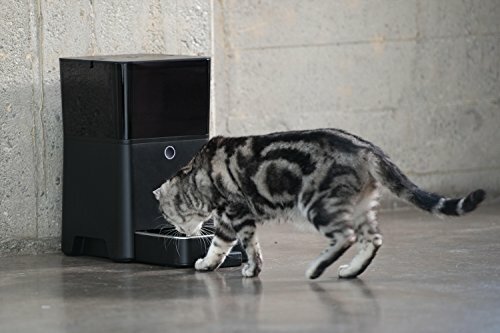 This automatic cat feeder ensures that your pet no longer feels like a burden. Feel free to leave as late as you want, and nothing will affect your cat’s eating habits. 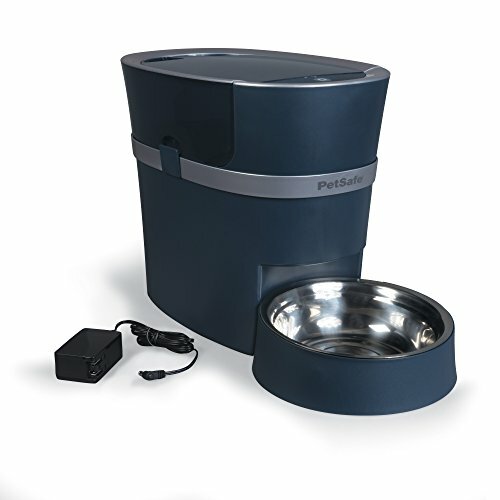 This pet feeder is battery operated and can be used for both cats and dogs. It dispenses up to six meals a day, and each of those can be of different portion sizes. 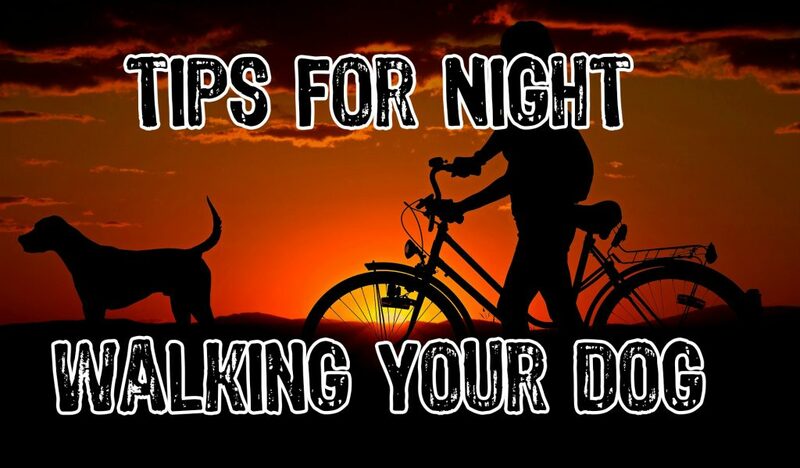 The batteries can last up to six months and therefore will serve you for a long time. 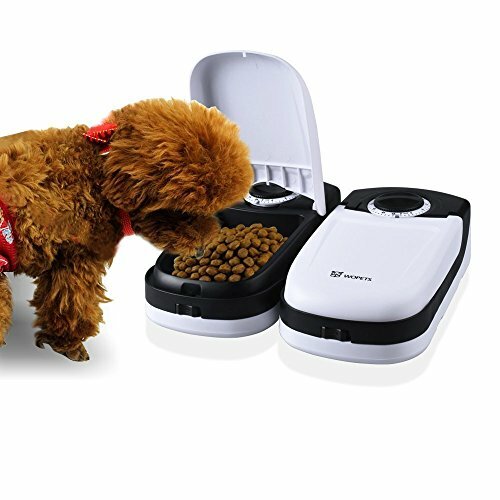 With a built-in feeding tray, you can be assured it cannot be pushed away from its dispensing unit by your pet. This also means that the unit can be thoroughly cleaned to ensure top hygiene. 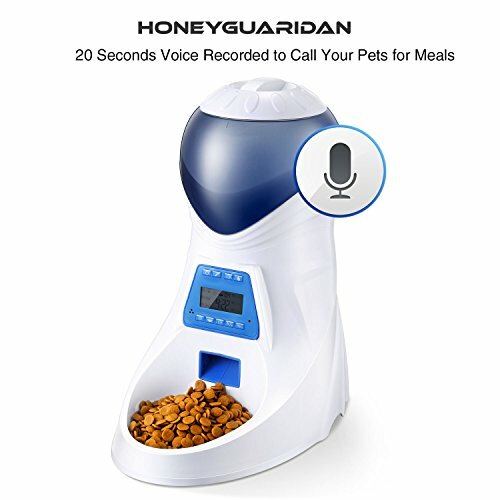 One nice and outstanding feature of this unit is its voice recording and playback system which allows you record your voice message to call your cat when it’s time for feeding. Its food hopper can hold 2.9 lbs. of food and has a twisted locking lid that cannot be opened by cats. The hopper is airtight, which helps keep food fresh for a long time. 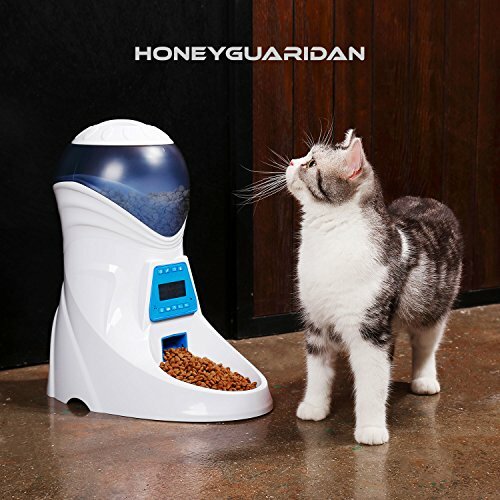 The HoneyGuaridan A25 Pet Feeder has a modern, clean looking design that will fit in well with most modern kitchens. It allows feeding on as little as 1/32 part of the cup to around seven cups per serving. You can program this cat feeder to dispense around six meals a day. 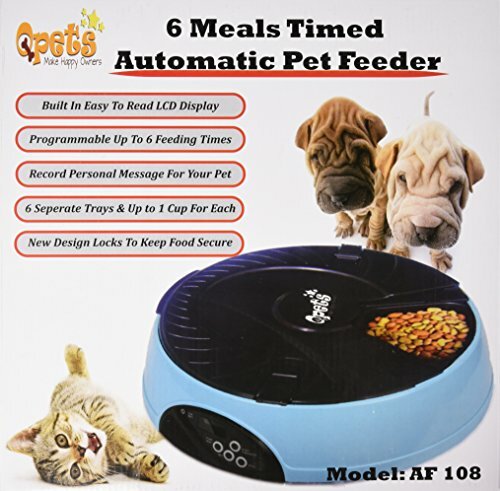 This pet feeder is battery operated and can be used for both cats and dogs. It dispenses up to six meals a day, and each of those can be of different portion sizes. The batteries can last up to six months and Need a modern solution which is more productive? The Petner SmartFeeder would be a perfect pick. This model handles time, ingredients and portions for you. If you doubt that, perhaps we can dig deeper into its precise features. This automatic cat feeder is as compatible as a smartphone. This means that it allows you to control how much you feed your cat and how often by just opening an app. This app boasts numerous exciting features to ensure that everything you do is at the comfort of your seat. You can get an overview of your feeding activities, size and time control. It also notifies you when your cat is in trouble so that you can know when your cat is not well fed. The maker of this app must have been very thoughtful as you can order healthy pet food through this exciting app. You will discover lots of fresh options allowing you to control almost everything at the comfort of your seat. The app dispenses food at regular time intervals and will not clog without your consent. The extensive array of features and the easy use makes this feeder an appealing choice. Practically, the automated feeder does show a few quirks. It works more efficiently with smaller kibbles especially if they have rounded edges. The app is swift to connect and easy to navigate even for novices. 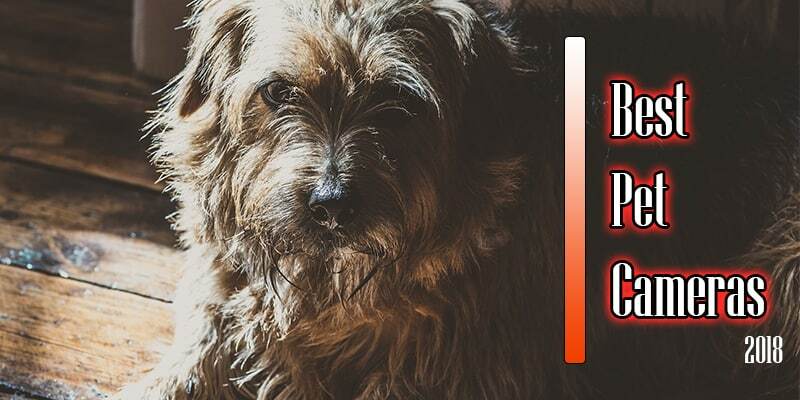 The smartphone convenience and cloud capabilities are superb for pet owners who need to keep track of how much and how often their pets should eat to ensure a steady supply of nutrition to these valued family members. 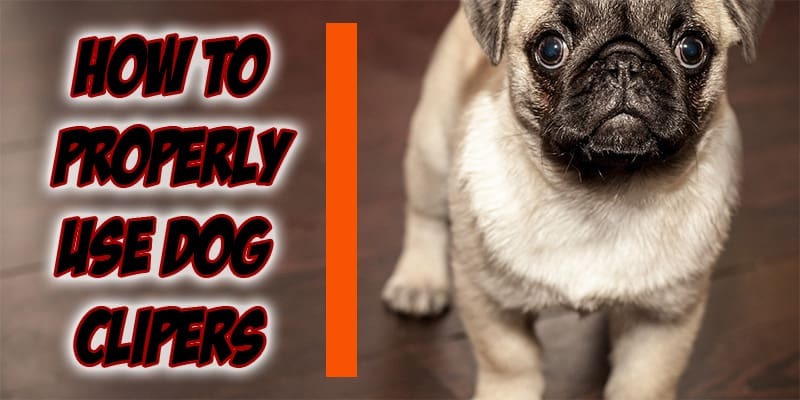 The Petner SmartFeeder may, however, not be a solid choice for owners who have large and giant dog breeds as it does not have such a large capacity to dispense at one time. That being said, you can know how much you may need to feed your cat on a daily basis, through the app. 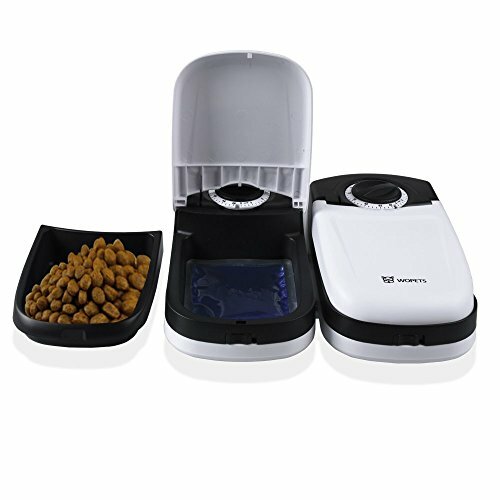 As one of the best automatic feeders, it helps you know the ideal portion size for your cat by assessing the age, weight and appetite. The app also offers a Food Report Card which digs down to the minutest detail about your cat’s general health as well as food intake. “The build is durable, and if your cat is the playful kind, this one is a strong exception. To make its cleaning an easier task, it has a removable stainless steel bowl which is also dishwasher safe. The feeder boasts a food hopper with an airtight lock up to keep the food fresh and cool. 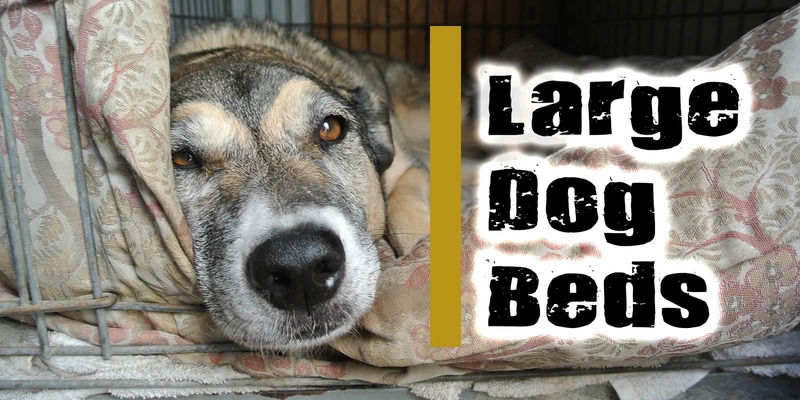 For pet owners who do not want to use an adapter as a power source, the feeder can run on a rechargeable battery backup. Cats are notorious for chewing the cord in an electric cat feeder, but with the Petner Smartfeeder, the chew-proof cable will suffice. Relatively easy to set up and operate. 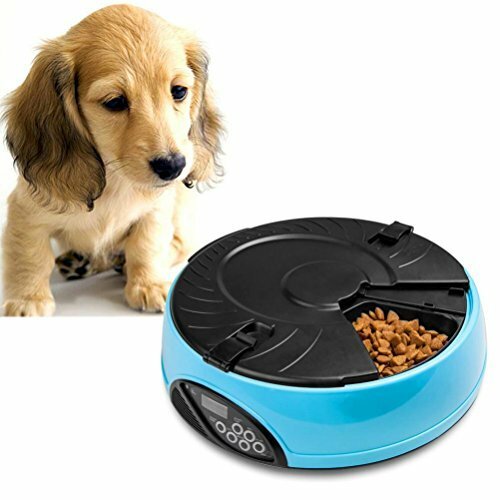 Removable food bowl for easy cleaning. With all advanced features and useful technologies, an automatic cat feeder brings lots of benefits for you and the cats; they make the feeding process easy and fun. This is the most important benefit; even if you are not with your cat for a few hours or days, it will be fed. This will help you stay stress-free because you will be assured your cat will get served its meal regularly in the course of the day. Having multiple cats mean multiple tasks and issues; you will need to feed each of them when they get hungry. With an automatic cat feeder, you can feed your cats at set intervals without any hassles. You can organize a proper food plan and manage food intervals for a whole day with the help of adjusted time and food portions dispenser. This ensures your cat does not overfeed or underfeed. Automatic cat feeders are a great investment for people seeking to feed their cat when they are not at home, seeking to regulate their cat’s feeding habits or ensure that their feline friend feeds on the meals they deserve. With many options available, it can get overwhelming to find a suitable automatic feeder for your cat. 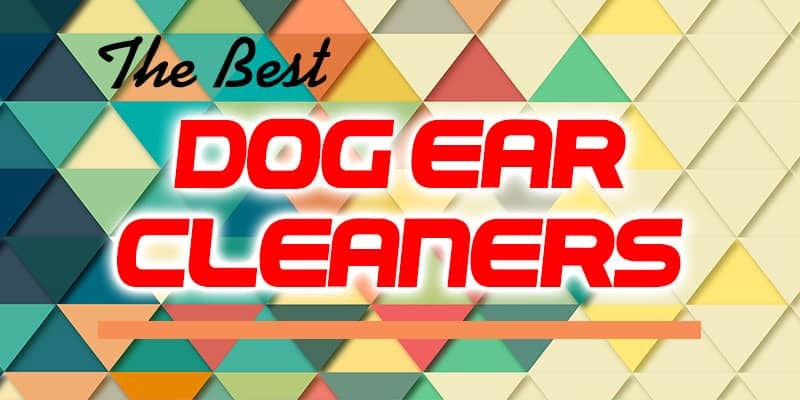 However, you cannot go wrong by choosing any of the above best automatic cat feeders. 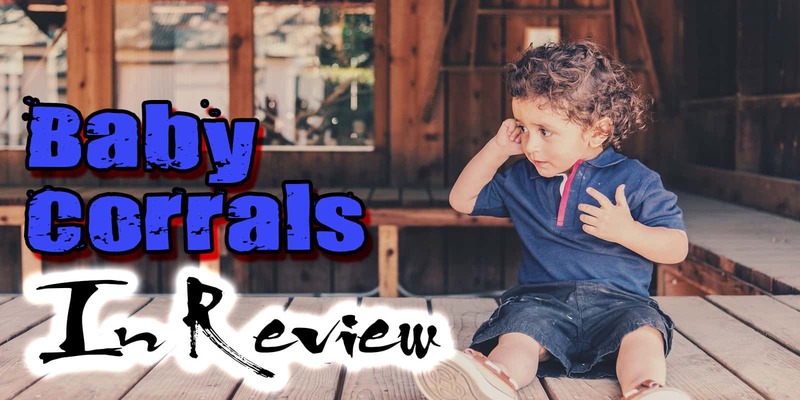 They are highly rated and proven to be the best in the market. 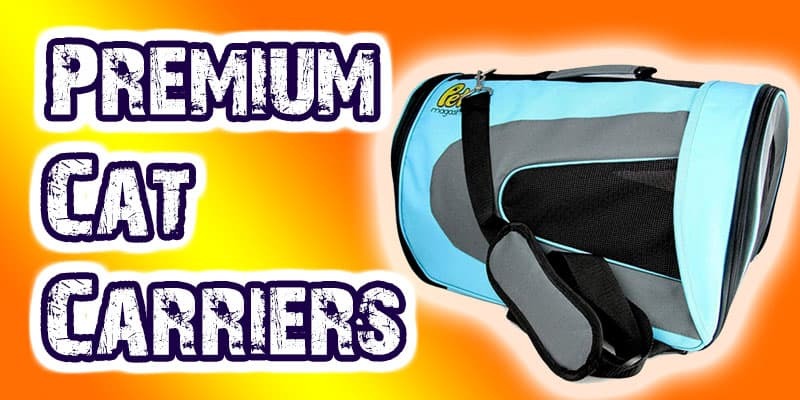 Choose the one you will find suitable for your cat’s needs.